Murano art glass is something made in the Island of Murano using the unique techniques developed by the indigenous Murano artisans. 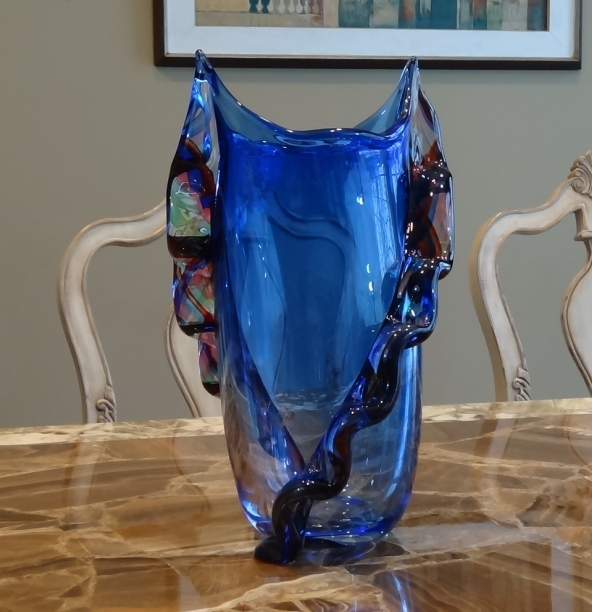 The history of the Murano glasses begin from the latter half of the 13th century when the glass workers and their extremely hot work shops were shifted wholesale to the Island of Murano, for fear of fire accidents in the Venetian cities. Isolated from the rest of the world, the artisans began to hone their skills and developed several unique te chniques of glass blowing and sculpturing. 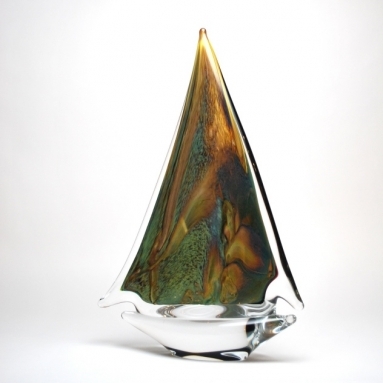 CALCEDONIO: Calcedonia art glass products were developed by the Murano artisans by the middle of the 15th century. The magnificently hued glass articles held the whole world in awe for a long time. The glass is prepared by adding silver nitrate to the glass preparations. The unpr edictable striations formed by this technique are the specialty of the calcedonia glass. AVVENTURINA: This is a technique invented by the Murano artists in the seventeenth century. This invention was more of an accident, when a worker accidentally spilt copper shaving into the molten glass he was working with and a new magnificently shimmering product resulted. Afterwards ot her metallic oxides also were embedded in clear glass to reflect light. BULLICANTE: This is a technique by which several layers of tiny bubbles are introduced evenly into the molten glass to form a grid like pattern. After this the glass is blown to form articles. This was a technique that became extremely popular in the 1950s. CRISTALLO: this is the most fragile looking glass objects made of pure white glass. The effect is obtained by bleaching the glass and then blowing it into brilliant articles. The designs on these crystalline objects are best etched manually. It is suited for making goblets and bowls. It was manufactured for the first time in 1450. 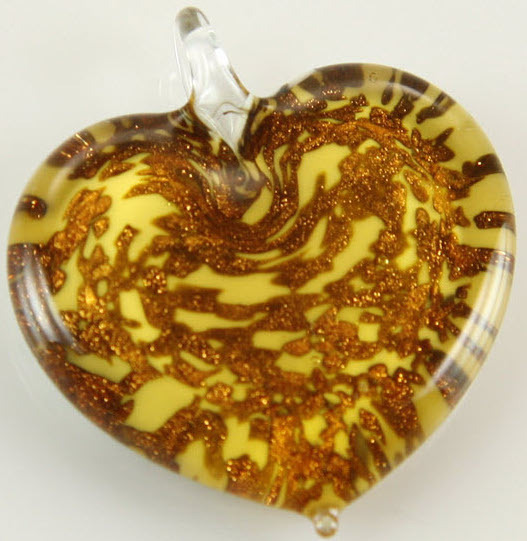 MURRINE: This Murano technique involves highly complicated technique. 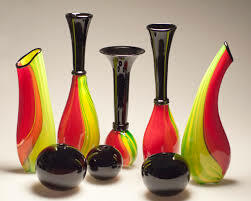 A central glass rod is repeatedly dipped in different colored molten glass. The thin cross sections of this rod is then embedded in molten glass and blown or sculptured into art pieces. The Murrine articles look spectacular. FENICIO: This is a murano technique that was developed in the 17th century. It is used to decorate a blown object with festooned decorations. 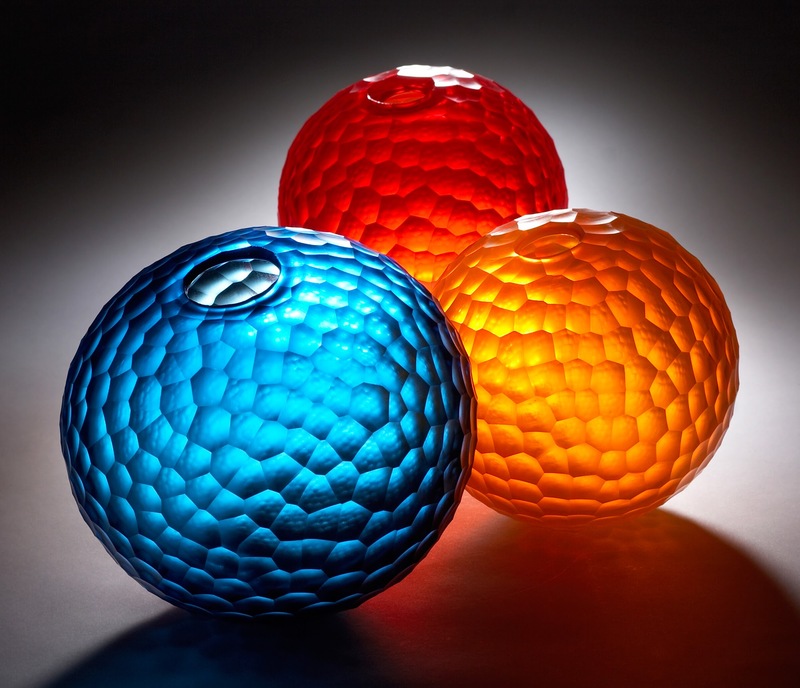 Incandescent threads of glass are put on blown objects and it is combed with a hooked tool while hot, to give it a festooned look. The objects thus crafted look fantastic. INCALMO: This is a technique that is use d to produce multicolored objects. Different parts of the article are blown separately in different colors. Then heat them again and join then while they are hot. The result can be really picturesque. RETICELLO: These objects are prepared by preparing black or white threads inside a clear rod. After that, equal portions of this rod is placed on a slab adjacent to each other and blown into objects. A fine net work of threads is formed on the objects which gives the object a fantastic appearance. 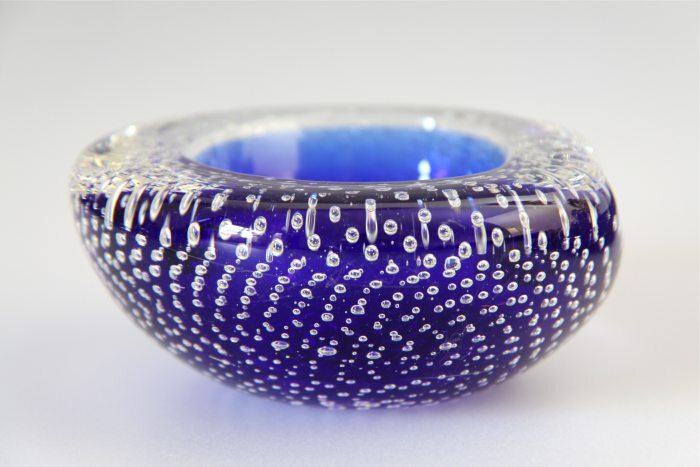 PULEGOSO: This murano glass has bubbles of various sizes and shapes on its walls. This makes the transparent walls less transparent but decorated with special designs. This is a technique that involves pouring substances like petrol to make the molten glass boil over and fuse the bubbles. RIGADIN: The rigadin glasses are characterized by the ribs on relief. This is made using molds. This is often used to fashion vases and goblets. The rib like patterns make the objects look wonderfully sturdy. FILIGRANA: This glass objects are made by embedding opaque or colored glass threads in a colorless glass rod. Then it is blown and shaped to form articles. 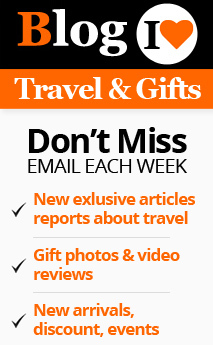 These articles will have beautiful colored threads forming grids and designs that twist along the article. This technique had been in use since 16th century. HALF FILIGREE: This work is done by first stretching glass rods having different colors inside and outside. Then they are placed side by side on a metal plate covered with clay. These are then heated in a furnace several times and then the worker shapes it into various objects. GLASS TESSERAE: This is actually a mosaic work made of different pieces of glass of different colors. Then the artist blows the slab made of different colors and shapes into various articles. It is used in church windows and other monuments. 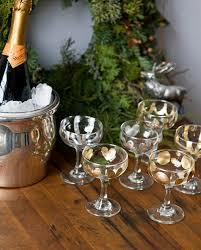 ICE GLASS: These glass objects have special and deliberate cracked appearance. The process is complicated and extremely difficult. The finished glass products are dipped in water while hot, which cracks it. It is then dipped into molten glass again to fill into the cracks. GOLD AND SILVER LEAF: This technique produces extremely beautiful objects. The process involves a wonderful technique. The artisan rolls the molten glass at the end of the blow pipe on leaves of gold or silver leaves. When this article is blown, the gold/silver leaves are broken into pieces to give the article a rare beauty. IRIDESCENCE: This glass articles reflect light to give them the rainbow appearance. The technique involves exposing the glass work in progress to the vapors of salts of metals like tin, titanium etc. it gives the object an iridescent look. BALOTTON: A mold is used for producing this glass objects. The mold is used to give it diamond patterns on relief. The objects look extremely beautiful. Bowls and goblets that are made using this technique will look wonderful. CASED GLASS: These glass objects are used by superimposing glass layers of two different colors. The inside will be of one color and the exterior of the object will be of a different color. Bowls and dished made using this technique will look highly decorative. 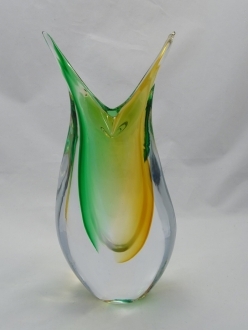 SOMMERSO: This murano technique was used in 1930s but the products became popular by 1950s. This technique involves dipping the products repeatedly in vitreous glass of different colors to give it different layers. This is also known as ‘sunk glass’. This technique is more used to produce vases and sculptures. MACETTE – SPOTS: This is a technique which produces beautiful Murano glass articles. As the name suggests it is a method that gives spots to the objects. For it the molten glass at the tip of the blowpipe is rolled on a surface strewn with glass pie ces of different colors. These pieces sometimes remain in the relief or get embedded into the glass. 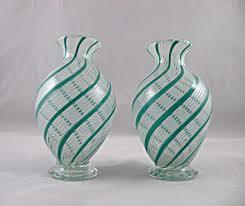 By further blowing the molten glass it gets distributed giving the object an irregular pattern. BATTUTO: this is a technique in which the artist engraves the surface of the glass articles using grinding wheels. The depressions on the surface looks like the impressions made when the wrought iron is beaten with hammer. It looks very beautiful on the Murano objects. 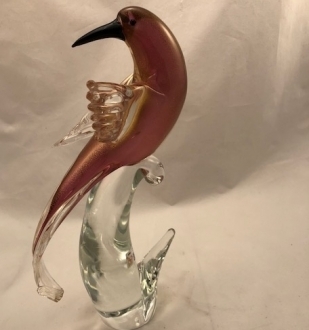 This technique was popular in Murano during the 1930s. 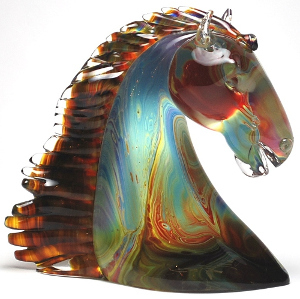 MASSICIO: This is done by shaping the molten glass while malleable, to form magnificent sculptures. The glass is not blown in this case. The shaping is done using various tools. MORISE: this is a d ecoration technique used by the murano artists to enhance the completed articles. A thread or cord is warm applied on the pieces to form serpentines and great decorations. Many murano vases and goblets are decorated like this to make it more decorative. Murano artists always find ways and means to make their products more decorative as well as functional. More and more techniques were invented by the artisans to improve their hereditary skills of glass bowing.